It is 8am and I am on a train to Baltimore and I couldn’t be any more excited! Way back when I started this blog, I learned of the existence of the Beer Bloggers & Writers Conference. I have always wanted to attend but for various reasons I never could. This year must have been fate because BBC2018 is in Loudoun County, VA. There was no way I was going turn down this chance (cue: Hamilton not throwing away my shot). But why am I on a train to Baltimore? Oh yeah, the conference doesn’t really start until Friday but I am checking out a couple of pre-conference excursions. My first excursion involves touring the new Guinness Open Gate Brewery & Barrel House near Baltimore, MD. I lucked out and was able to snag my second excursion to Dogfish Head. I suspect my face will be a lot like this time with Sam at Circuit. Follow along with me on Instagram and Twitter to experience the trip with me. Then stay tuned as the conference descends on Richmond for a post-conference excursion and my ride home! Head over to California Pizza Kitchen in Short Pump tonight September 26th at 5pm as they tap a few Dogfish Head beers and display art in support of Screens ‘n’ Suds’ fifth year of raising money for MS Society. The chef will be preparing several unique menu items specifically created to pair with Dogfish Head’s craft beers. 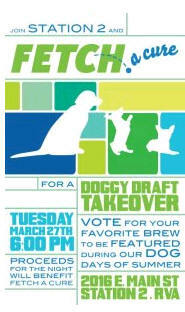 There will also be Dogfish Head glassware to steal. 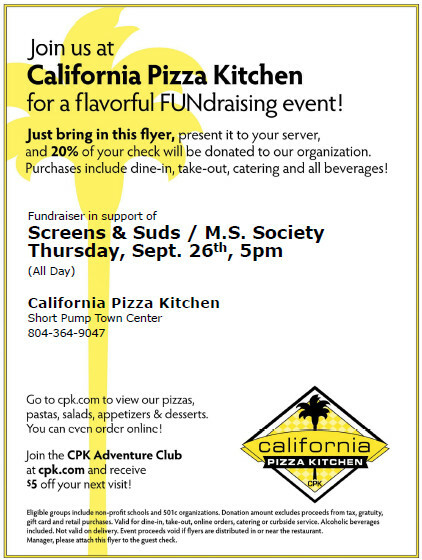 Be sure to print the flyer below or grab the PDF here and give it to your server and CPK will donate 20% of your bill to Screens ‘n’ Suds. Leading up to next Sunday’s Carytown Craft Beer Festival, Carytown Cupcakes will be featuring craft beer flavors from April 8 – 14th. 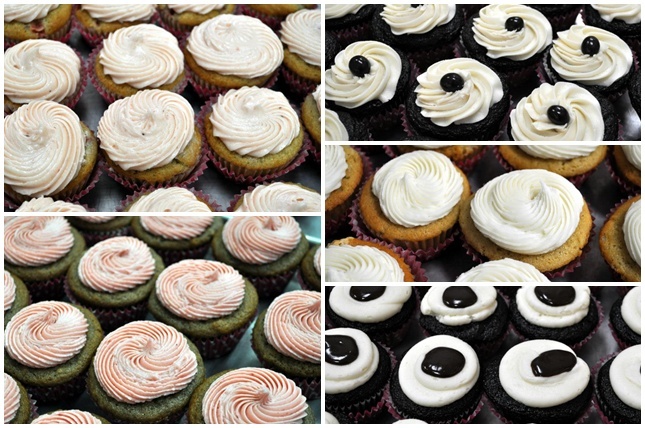 I have enjoyed many of their cupcakes in the past but especially their vegan flavors. It is no surprise to see Hardywood featured so prominently. Gluten-free Richmonders will be pleased by the use of Dogfish Head’s Tweason Ale. Where To Steal The Glass Tonight? So my plans for tonight were pretty simple. On The Rox for happy hour to celebrate SMCRVA’s 3rd birthday then Capital Ale House for their Unibroue Steal the Glass night. I was quite intrigued when I found this extensive list of recipes for all of Unibroue’s different beers. 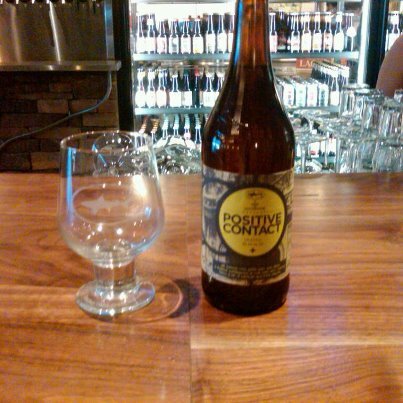 At least that was the plan as of a few minutes ago when I learned that not only is Sedona Taphouse having a Dogfish Head tap takeover with 10 different beers, they will have a limited quantity of Positive Contact and Urkontinent. Then Sedona drops the hammer by turning by saying they will be giving away these hand blown Dogfish Head goblets. I’m still on the fence on where I should go tonight but I’m sure wherever I go there will be great beer involved. The hounds will be loosed at 6pm. Head over to the Facebook event for more information. 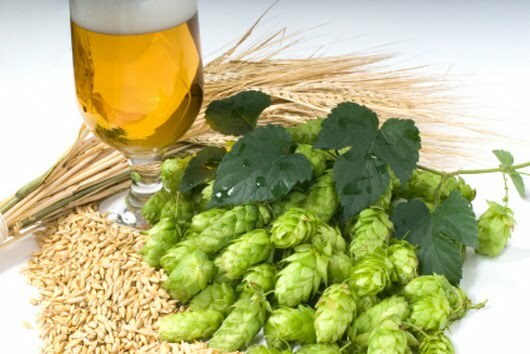 Calling all hopheads! Have you been turned off by beer dinners of the past that dared to serve malt bombs? Not to worry, TJ’s at the Jefferson had you in mind when they came up with their first ever Charity Hop Beer Dinner on Friday, March 16th. TJ’s will be working in tandem with Screens and Suds to raise money for Richmond MS. The dinner will be $50 per person and will include a donation. TJ’s will be matching the donations for the evening and be giving a portion of their sales for the evening to Richmond MS. Dinner starts at 7pm. Call TJ’s at (804) 649-4672 or email at jonathan.kibiloski@jeffersonhotel.com for more information or reservations. Cheers! An extra day in the month meant I was supposed to have extra time. Somehow that did not happen. Well there’s no way I’m letting this 29th day of Februrary get by without having some fun. This tweet from Dogfish Head had me wondering how many different ways could we celebrate Leap Day with beer. Let’s see how many different beers qualify if we use the numbers 29 and 60. Weyerbacher’s anniversary beers immediately came to mind. You could have a Fourteen and a Fifteen, 4 Fifteens, 2 Fourteens and 2 Sixteens. This one requires math but the end results are fun. The Bruery’s Cuir comes in at 14.5% ABV so you only need two to get 29. He’Brew Jewbelation Fifteen fits for anniversary beers, but it also works for ABV. With 15% ABV, you’ll need four to get to 60. Bell’s Amber is only 5.8% ABV so getting to 29 will knock you back 5 of these. Looks like that’s all I really could come up with but I think it’s plenty. Besides it’s not as if you really needed an excuse to drink great beer from me.